There are 6 reviews of Cool Water Night Dive. Similar to Paris Hilton For Men. Whether you think that's a compliment to PHFM or a detriment to Night Dive probably depends on your taste. Night Dive is a better fragrance than PHFM, but that's not asking a lot. It doesn't perform as well, however. Neither is offensive and both are wearable, so I'll go neutral here. Not a must-own, but for the price, a decent change of pace buy for those looking for a little bit a fun. 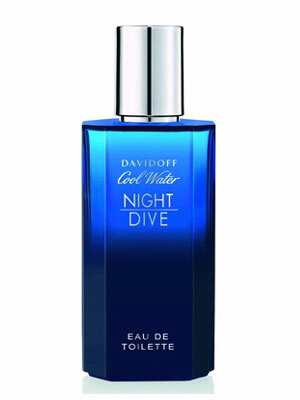 Cool Water Night Dive is an amazing scent that I find is great and rather long lasting. For me, I find it even works in the day time. Mint, berries and pepper make it different from most aquatic scents I've tested or bought and used in the past. It is refresing both in smell and what they were able to do with it. It is an aquatic that you can wear at night but still doable during the day. I got this one blind from Kohl's for under $20 for a 1.7oz/50ml gift set because it was overstocked I guess. My gain. But with this review comes a weird fragrance confession. That confession is while I have smelt Cool Water but never owned one of my own because I have B&BW's Ocean and Bigelow's Barbershop Elixir Blue which smell close enough to the original Cool Water. After buying this, I just might breakdown and buy it, but I will have possibly too high expectations based on this flanker of the classic aquatic. I have to give it a 9/10 for price, smell and the fact I can get a work day out of this cologne which you don't really hear for minty fragrances. Despite the neutral rating, I'm rather partial to this scent. I think as a concept, of a spicier, more oriental (in fragrance terms) and more 'mysterious' take on the original, it works very well. I have enjoyed wearing this on Mediterranean holidays, particularly when going out on a hot night. Nice with some good chinos and a navy polo shirt. In fact, if I ever decided to get a job hiring out sun-loungers on a beach or something, I'd probably wear this frequently. However... most of the time, sadly, I am not on holiday in the Med., and this does not really suit any of the other requirements I have. Another issue is with the way it sits on the skin. Something in it - and I couldn't say if this was one of the notes (the cashmeran?) or just the way the ingredients work together - makes it feel like a layer of laminate plastic on me. Or perhaps like a coat of wax. It is rather heavy, and while this does wonders for longevity, it's not the most pleasant 'vibe' I've ever had from a fragrance. I do love the bottle, though. I'd probably recommend for younger men who spend a lot of time in hot climates. Just watch yourself diving at night. This is one of those scents that smells 'very good' on the tester card, but just 'ok' on skin. I like the concept and I find the bottle attractive enough. I think Davidoff have achieved in making this a deeper Cool Water in a way; I get a darker blue smell with some deep green undertones. It has a slight spice and can come off rather synthetic up close. The sillage is pretty good on me but the longevity is average at best. I will give this a neutral. I find it pleasant but nothing that grabs the attention or worth replacing when finished. Unoriginal in a unique way. I myself am surprised how much I actually like this fragrance. Successfully emulates the depth of a sea, not too cold, not too warm. Invasive in it's syntheticity but only from up close. As the energy of it is dissipated in the air, it shows its simple magnificence creating the aura of bitterness, because of the dominant note of sage. Musk and woody notes balance it nicely, amber is quite potent more or less. New frangrances old concepts. Nowadays the olfactory market is becoming more and more full of new commercial "war machines" which catch two of the most presumptively attractive genres (aquatic and spicy-oriental) and try to combine those together in order to issue new salty-sweet intoxicating ambroxan-Iso E super-galaxolide bombs "bloodthirsty" in their aim to conquer the market's fields. Same recipe in Cool Water Night Dive namely a fresh peppery aquatic opening (with a really salty synthetic vaguely fruity disturbing approach a la Boss Bottled Night- which smells better) and a fast following evolution towards aromachemical mastered musky-ambery-spicy territories yet previously "beated" by scents a la Gucci Guilty, Davidoff Hot Water, Azzaro Pour Homme Elixir and dozens more. Frankly the peppery musky-ambery-synthetic tobacco flavoured dry down is boring and overly sweet, having almost nothing in common with the original Cool Water and with the chilly oceanic (advertised) night vibe. A failure. There are no member images of Cool Water Night Dive yet. Why not be the first?